Institute for Health Metrics and Evaluation (IHME) and Public Health Foundation of India (PHFI). 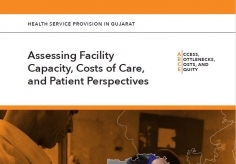 Health Service Provision in Andhra Pradesh and Telangana: Assessing Facility Capacity, Costs of Care, and Patient Perspectives. Seattle, WA: IHME and PHFI, 2018.